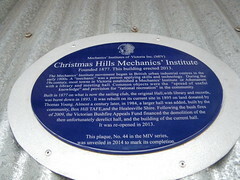 Christmas Hills Mechanics' Institute. Founded 1877. This building erected 2013. The Mechanics' Institute movement began in British urban industrial centres in the early 1800s. A "mechanic" was a person applying skills and technology. During the 19th century, most towns in Victoria established a Mechanics' Institute or Athenaeum with a library and meeting hall. Common objects were the "spread of useful knowledge" and provision for "rational recreation" in the community. Built in 1877 on what is now the sailing club, the original Hall, with library and records, was burnt down in 1893. It was rebuilt on its current site in 1895 on land donated by Thomas Young. Almost a century later, in 1984, a larger hall was added, built by the community, Box Hill TAFE, and the Healesville Shire. Following the bush fires of 2009, the Victorian Bushfire Appeals Fund financed the demolition of the then unfortunately derelict hall, and the building of the current hall. It was re-opened in 2013. This plaque, No. 44 in the MIV series, was unveiled in 2014 to mark its completion.